Just in case the cloud music services of Google, Amazon and Apple weren't enough for you, Best Buy has quietly launched its own, called Best Buy Music Cloud. Best Buy's offering comes in two flavors, Lite (free) and Premium ($3.99 per month), and is pretty much the same as its competitors, with a few hitches. 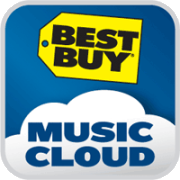 After you sign up for Best Buy Music Cloud, you download a desktop client for Windows or OS X. The Best Buy Music Cloud app then scans your iTunes library and uploads songs. As of now, the service can only be used when connected to iTunes. You cannot upload music through any other music player or even put files in the cloud through folders or directories, as you can with Amazon and Google's services. This probably will change in the near future because the value of the service will decrease once Apple's iCloud -- also tethered to iTunes -- is launched. Best Buy hasn't "officially" launched its music service, nor has storage limitations been detailed, but a blog post on the retailer's site runs through the initial stages of set-up. Strangely, the iOS version of Best Buy Music Cloud only supports the Lite version, whereas the BlackBerry and Android apps support both the lite and premium versions. If the cloud service is currently tied to iTunes, why isn't it playing nice with all Apple's software? Also, the Lite version only allows you to stream the first 30 seconds of songs you own, which begs the question: Why upload in the first place when you can listen to all seconds of all songs either on a competing cloud service or through your device's physical storage. Maybe Best Buy Music Cloud will make more sense once Best Buy removes the veil and launches a PR campaign.